Northern Health is pleased to partner with Share the Dignity as the first Victorian hospital to install a #Pinkbox Dignity Vending Machine. Speaking at the launch, Northern Health Director of Respiratory Medicine, Dr Katharine See, who was responsible for initiating the project, said Northern Health believes that all women deserve dignity and justice, and is pleased to be the first hospital in Victoria to install a #Pinkbox. “Partnering with Share the Dignity is another way that Northern Health is able to support vulnerable women in our community, and is a wonderful adjunct to our commitment to a culture of respectful relationships and gender equality,” said Dr See. 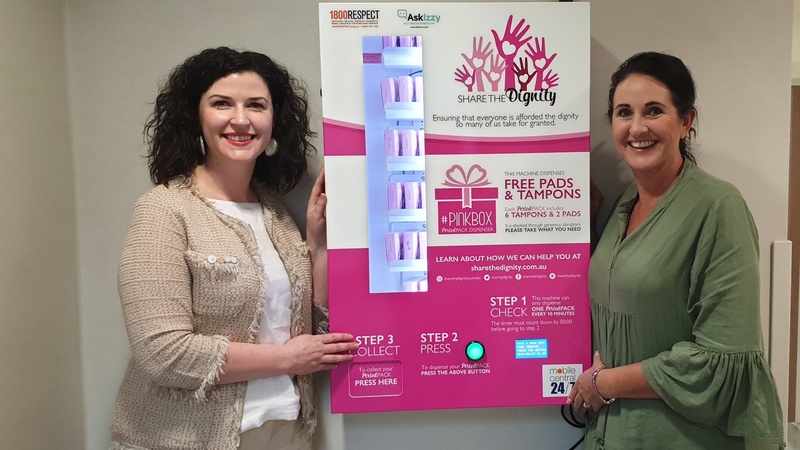 Share the Dignity created the world’s first completely free vending machine, which dispenses period packs containing two pads and six tampons. There are currently 100 #Pinkbox Dignity Vending Machines installed across Australia. “So many women, every month, have to forfeit sanitary products because they cannot afford them,” said Share the Dignity National Pinkbox Coordinator, Claudette Laidlaw. Last week alone, the #Pinkbox vending machines dispensed 858 period packs, with this number rising each month. Share the Dignity founder, Rochelle Courtenay, said the organisation holds Christmas appeals every November, encouraging donations of pre-loved handbags, filled with sanitary products and necessities. “Last year was the first year we were able to say the bag went to every woman spending Christmas in a domestic violence shelter,” she said. Rochelle added that she is very proud of the work they do, and especially proud of the #Pinkbox Vending Machines. The idea for the free vending machines came from Rochelle’s visit to a homeless shelter in Hosier Lane, when she realised women in need don’t have easy access to sanitary products, and are limited in choice, often surrounded by men. “I am always reminded how important these machines are. Women often come to me and say that after fleeing domestic violence they have a need for legal help, accommodation assistance and help with the kids, and often feel like they shouldn’t be asking for sanitary products after all that,” she said. These free vending machines make sure everyone gets the dignity they deserve. “This is the first hospital in Melbourne to install the machine and I hope there will be many more following the lead,” Rochelle added.